Because the National Geospatial-Intelligence Agency (NGA) provides geospatial intelligence services to a wide spectrum of users including US policy makers, the armed forces, intelligence agencies, and first responders, it needed greater data interoperability. But, as with many mature organizations, NGA’s data and applications weren’t designed for the demands of immediate accessibility. So the agency is migrating to a cloud-native environment to make its computing resources instantly available across the enterprise. Gordon is known as NGA’s innovation advocate and, among other initiatives, has introduced new programs to further NGA’s relationships with vendors, including the Commercial Initiative to Buy Operationally Responsive GEOINT, or CIBORG. This is a partnership with the General Services Administration to facilitate purchases of commercial GEOINT capabilities and services. 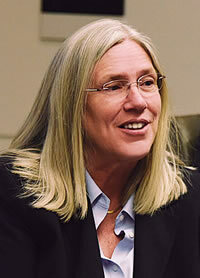 Gordon became the agency’s deputy director in 2015 after more than 25 years of service with the Central Intelligence Agency (CIA), where she served concurrently as the director of the CIA’s Information Operations Center and the CIA director’s senior adviser on cyber. She recently spoke with Esri about the importance of GIS at NGA and her plans for future innovation at the agency. What are the advantages of migrating NGA to a cloud-native enterprise? 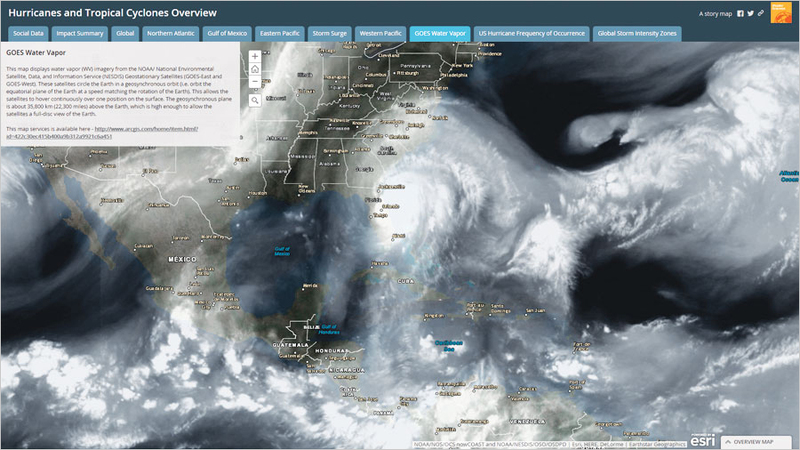 For Hurricane Matthew in 2016, ArcGIS Online was used to create new views instantly whenever new data was provided. Our move to the cloud has three primary benefits. What started us on this path was the prospect for interoperability and more shared data. There are lots of components to this, but basically, we wanted our data to be more widely available among the intelligence community and combat support entities. Developing everything in the cloud allows for that. Secondly, we will take our existing data, put it into the cloud, and redesign the apps that use that data so that they both operate seamlessly in our cloud environment. Adapting our legacy systems to the cloud environment is the most challenging and forward-thinking thing we’re doing. The third part of our cloud migration strategy is to make data more available on all classifications—not just top secret, where the intelligence community typically operates, but also at the secret and unclassified levels, where our combat support partners and customers work. We’re expanding its use for humanitarian relief and other civilian operations as well. What role does GIS play in providing GEOINT services to the intelligence community? GEOINT services give users the means to employ NGA data, and GIS is typically the foundation for those services. It is the toolkit that allows people to use data in a customized way within a common framework. Historically, there was such a tight coupling between an app and its data that using the data was restricted to that specific app. Now with GEOINT services, the two have been separated so the data can be used in any app in which it is needed. What is interesting about our commitment to GEOINT services is that we are learning more about what it means to be a service provider and how to respond to our users so they get the greatest benefit from our data and apps. 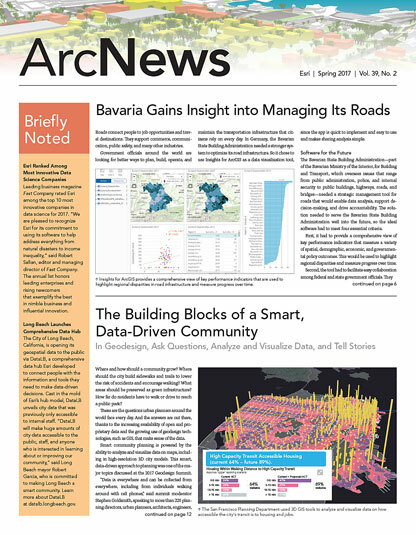 One of our really great approaches is the use of ArcGIS as a geospatial framework, since it is in common use in the industry, allowing our users to quickly access our data and apps. The Arctic is relatively undermapped because of its remoteness. NGA uses what’s called the IC GIS Portal to collaborate and share data across the intelligence community. What are some of the successes of this initiative, and do you anticipate its use to grow? The IC GIS Portal, which is our first GEOINT service and provides easy access to NGA data, is now about two years old. Within that time, we’ve grown from zero users to almost 60,000 users worldwide. Based on ArcGIS, the IC GIS Portal is a platform for analytics, collaboration, and data sharing that is used throughout the intelligence community—right down to the war fighter. So imagine you are in a deployed location, and you want to present the operating picture that you see using all the data that multiple sources have made available to you. When you use the IC GIS Portal, you have a framework that you know will support the inclusion of multiple data types and allow them to interact to produce both the visualizations and the analytics you need. Right now, the IC GIS Portal is on our top secret network, but we have plans to drive it to the other networks. That will really expand its use. One of NGA’s core missions is to provide mapping and charting products for the intelligence community. How is NGA modernizing the process to manage, produce, and share GEOINT? As mentioned, the cloud environment provides NGA with three strategic capabilities: interoperability, legacy system integration, and the comprehensive provision of geospatial services to the intelligence community. Because navigational data is key to the successful outcome of many of our missions, we maintain a vast collection of aeronautical, nautical, and terrestrial data that is continually updated. Storing this data in the cloud provides easier access, enabling it to better serve as an asset to the intelligence community. Our worldwide foundation data includes topographic features, elevation, precise point positioning, and geodetic information. This data rarely changes and can also be easily accessed from the cloud to support activities such as intelligence analysis, operational planning, modeling and simulation, command and control, and joint intelligence operations. We are in the process of modernizing our foundational GEOINT to substantially improve the quality of its content and management. The backbone is an enterprise GIS platform that captures, stores, manipulates, analyzes, manages, and presents all types of geospatial information. We are implementing a centralized database that collects data from multiple sources and updates it in near real time. Again, our focus is on determining how we can make our data more commonly available to the greatest number of users in the intelligence community in the most efficient way. How is NGA leveraging the growth and availability of commercial and unclassified data to improve its capabilities in intelligence analysis? 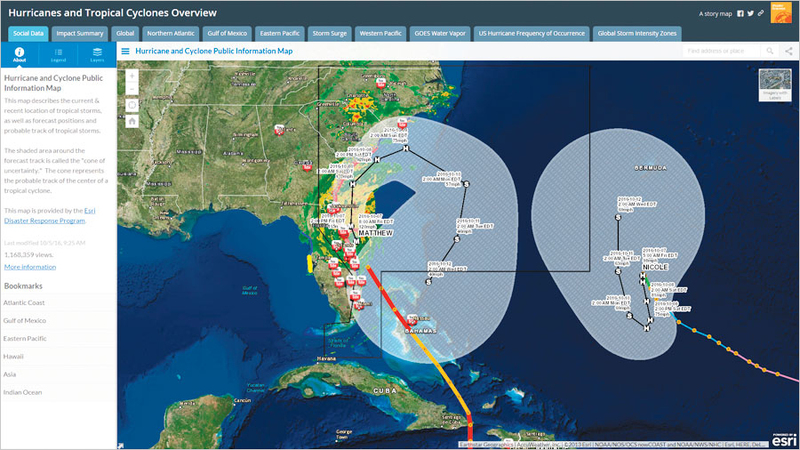 With the use of ArcGIS Online during Hurricane Matthew, the National Geospatial-Intelligence Agency (NGA) was able to widely distribute new information to those involved in the emergency response and recovery efforts. Today, the amount of openly available geospatial content, images, and geospatially enabled data is absolutely staggering, and many of our analysts need data produced outside the intelligence community. We are committed to providing that data by establishing partnerships to identify, evaluate, and use all sorts of data—from commercial, airborne, and handheld imagery to social media products and related services. To do this, NGA is looking into acquisition methodologies and business relationships with other producers to take advantage of everything that is available to us. For example, NGA recently partnered with the National Reconnaissance Office (NRO) to form what we call a Commercial GEOINT Activity (CGA). Our intent is to form a clearinghouse where we can make our needs known and companies can proffer their services and products. We will then evaluate the effectiveness of offered capabilities in relation to our needs. This will allow NGA and NRO to perform a service for both government organizations and companies that want to do business with us. The CGA is only a few months old now, but it will be valuable for understanding how all the available geospatial data and services can meet our needs. Recently, NGA made efforts to improve its transparency to the public and increase its support of disaster relief efforts and other activities using unclassified data. How would you describe NGA’s success in the use of ArcGIS Online in support of Hurricane Matthew and the Arctic Support Data? Among my favorite stories is our use of ArcGIS Online in support of humanitarian relief efforts that developed as a result of our partnership with Esri. This platform allows real-time interaction with both emergency responders and data providers that is truly stunning. 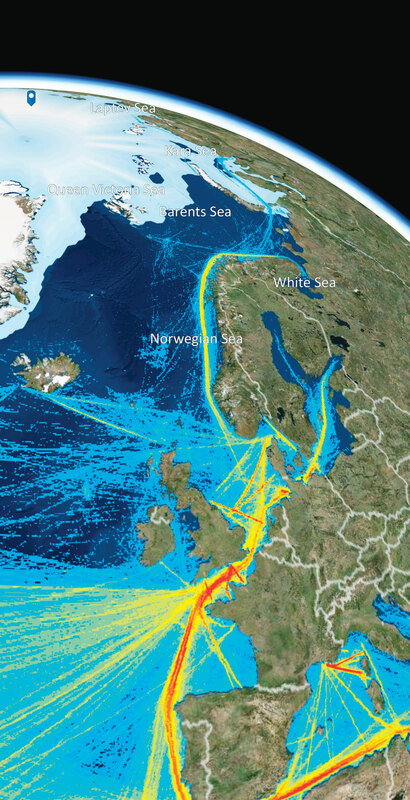 Previously, situation updates required the collection and processing of geospatial data and from that, we created a new view of the area of interest for analysis and response. With the use of ArcGIS Online for Hurricane Matthew, whenever new data was provided, new views were created instantly and then widely distributed to those involved in the emergency response and recovery efforts. 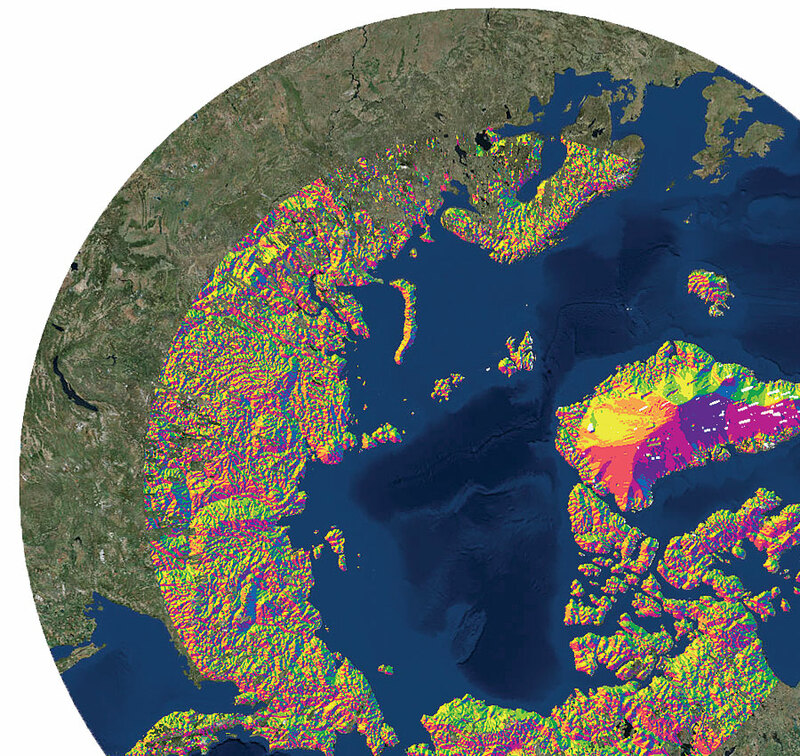 The ArcticDEM was a collaborative project that included NGA, the National Science Foundation, the University of Minnesota, Cornell University, Ohio State University, and Esri to automatically produce high-resolution, high-quality, digital elevation models (DEMs) of the Arctic using optical stereo imagery. Surprisingly, the Arctic is relatively undermapped—not underexplored, but undermapped—because of its remoteness. NGA collects a lot of big data from a range of sources and in a variety of formats. What is NGA doing to better integrate and manage this data, and how can GIS best serve as the integrating platform? NGA director Robert Cardillo talks about creating coherence from chaos. That’s really what this is about. How do we take the vast amount of data that exists and structure it in a way that lets us better analyze and understand the situations that confront us? GIS is so important to integrating this data because it all needs to be maintained in a common format and displayed within a common framework. That’s the approach we’re taking with data: It looks noisy; yet we can turn it into something that is widely understood, and then we can act on that data together. You are well-known as an agent of change in the intelligence community. What is your secret to implementing innovative solutions in such a large government organization like NGA? I believe that I am supposed to get things done, and to do that, I sometimes have to find new ways to operate. I also believe that current systems exist for a reason. So I first take into account what those systems are accomplishing before showing people how that can be achieved in a better, different way. The government wants to be perceived as deliberate, so its actions need to be constant and repeatable and it has to be transparent and fair. No government agency can take the same chances that private industry does. So when I do things differently, I must show that my new methods are still accountable. At NGA, we go a bit against the grain because of the GEOINT space in which we operate. But although we are a little bit revolutionary and certainly have an entrepreneurial spirit, we also trust our long-time partners, such as Esri, because we share a common vison about the impact GIS can have in so many areas—from national security to humanitarian relief.